In my last post, I showed you how I automated my Kubernetes lab build out by using Salt. This took the build time and cut it by more than 70% (Im guessing here but you get the point). 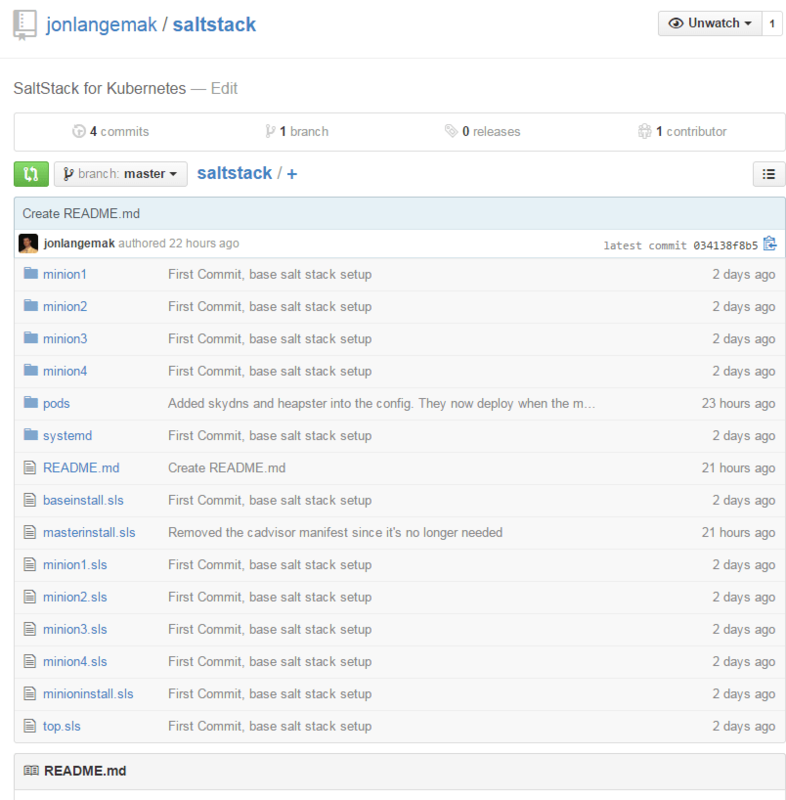 In addition, I’ve been making all of my changes for the cluster in Salt rather than applying them directly to the host. Not only does this give me better documentation, it allows me to apply changes across multiple nodes very quickly. You might be wondering why I chose Salt since I’ve blogged about Chef in the past. The answer isn’t cut and dry, but Salt just made sense to me. On top of that, there is VERY good documentation out there about all of the state and state functions so it’s pretty easily consumable. As I walk through the process I used to create the lab build scripts, I hope you’ll start to catch onto some of the reasons that made me decide to learn Salt. The goal of the top file is to apply state ,or a series of states, to a series of minions based on matching criteria. We can see that the 2nd and 3rd line tell Salt that all (*) hosts should have the state ‘baseinstall’ applied to them. Note: You’ll notice that you dont need to add the file extension (.sls) when referencing state files in Salt. Keep this in mind when writing your state files. This is just a section of the output, there’s ~50 predefined grains that you can query against. So in our case, we applied state in the top file based on the grain called ‘host’. We need to tell the top file that we want to match on a grain and then tell it what states to run against those matches. Pretty slick huh? You could see how powerful this would be if you needed to apply a patch against all ‘CentOS 7’ hosts or something along those lines. In this example, we’re pulling down the docker configuration file from the master to the host. Recall in our last post we talked about the master ‘file_root’ that we defined to be ‘/srv/salt/’. This tells the minion to download the file ‘/srv/salt/minion1/docker’ and place it on the minion as ‘/etc/sysconfig/docker’. We also set some attributes of the file such as owner, group, and permissions. The first thing we need to pay attention to is the ID Declaration. In this case, I’m defining the file name I want to use as the target. This is a little confusing because the ID in this case not only defines the identification for this state, but it’s also the target destination of the state, AKA where I want to put the file. In other cases we’ll see later, the ID is nothing more than a unique identifier and plays not part in the actual configuration. Note: The ID can NOT be duplicated either in a single state file, or a set of state files executed on the same minion. Once we define an ID, we need to tell it what state we want to use. In this case, we’re manipulating a file so we want to use the ‘file’ state. It’s important to note here that lines 3 and 4 above could be made into one line that read ‘file.managed:’. I didn’t know that at first and that syntax makes a lot more sense to me so I think I’ll use that going forward. So now that we know what state we’re using, we can use one of that states functions. In this case, we use the managed function which allows you to download files from the master and place them on the minions. The rest of the configuration consists of function arguments on what file we want to place and the associated ownership. Here we have a state that does two things. Here the ID is ‘docker’ and we’re applying both the pkg state to install docker as well as the service state to enable and start the process. So as you can see, Salt is pretty flexible and this isn’t even scratching the surface of the power of salt. The next item up for investigation are what Salt calls Pillars which look pretty awesome. I know this was a brief intro, but I wanted to get some info out there after my last post so you could start digging into Salt some more. I’m hoping to have some time later this week to dig more into Salt pillars and as I learn more I’ll do my best to blog about them.